Ajahn Sumedho, first abbott of Amaravati, wrote a short preface for this new edition. Laung Poh Luang Por Ajahn Sumedho is the most senior representative of the Thai Forest Tradition of Theraveda Buddhism in the West. He was integral in establishing the Forest Sangha tradition in England and the Amaravati Buddhist Monastery and Chithurst Buddhist Monastery, both in England. Jetsunma Tenzin Palmo, founder of Dongyu Gatsal Ling Nunnery – subject of Cave in the Snow by Vicki Mackenzie & author of Reflections on a Mountain Lake. Ajahn Amaro, Ajahn Sumedho’s disciple, abbott of Amaravati monastery in the Forest lineage of the Theravada Buddhist tradition. « Edward Salim Michael’s teaching goes straight to the heart, making us realize the commitment, energy and love it takes to realise the truth at the deepest level. Ajahn Sundara, nun of Amaravati monastery in the Forest lineage of the Theravada Buddhist tradition. 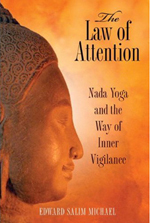 2 – The attention and its importance. 25 – Meditation and the after-death state.